Swedish star Sarah Sjostrom has clocked a 23.87 in the 50 long course meter freestyle on the final day of the 2017 Bergen Swim Festival Sunday. 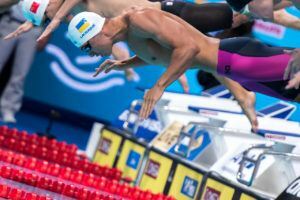 That swim ranks as the 3rd-fastest performance in the history of the event, behind only the 23.73 World Record of Britta Steffen and the 23.83 that Sjostrom did a month ago at the Stockholm Open. Sjostrom has been knocking on the door of her personal bests in most events this weekend. She swam 52.86 in the final of the 100 free, slower than her best of 52.54; and 56.32 in the 100 fly, about a second slower than her World Record best of 55.48. The 50 free has emerged as a new, exciting event for Sjostrom this season. She’s gone 24.01-or-better 4 times this year after Sunday’s swim – something she had done only once (a 23.98 in 2014) prior to 2017. I’d say WR at the Swedish nationals, which will be hosted at the same venue where she broke her 50 fly record! Hard to WR in the splashy championship pool. Fantastic. It was her fifth race of the day aswell. Heat & semi in 50 free and heat & final in 100 fly. Although a little warmup seemingly has never hurt her 50. When is the Swedish nationals? Interesting that her day 2 performances were much stronger than her day 1 performances. She hasn’t had a major drop in her 100free like her other events yet, but I think the time has come. She has been underswimming that event relative to her others for 3 years now. Was day 2 really that much stronger though? Remember 50 butterfly used the ridiculous knockout-system, i.e. heat in morning and then quarter-semi-final in the span of about 15 minutes. 100 free was a very good time.